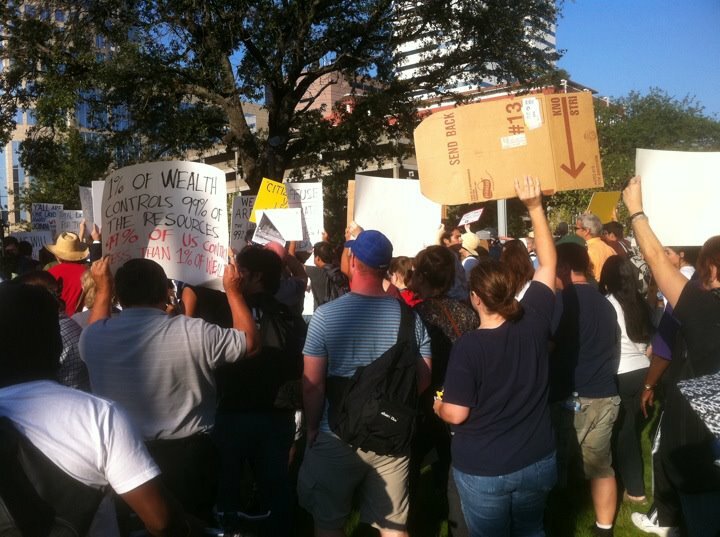 Today I attended the Occupy Houston event in Downtown Houston. Here is why I got involved in this effort. Though Houston police estimated the crowd to have been about 200, I think the crowd was larger than that. It may have been closer to 500 at the beginning. In any case, the event had some energy and it felt like a good start. Houston police officers were helpful. They helped the march run well. In Ohio, the Republican governor and the Republican state legislature essentially ended the right of police officers to collectively bargain. Police officers are working people just like anybody else. If the Tea Party/Republican Party will mess with politically popular police unions, what chance do other working people have with wages and worker’s rights? Below are folks this morning organizing for the day ahead at Market Square Park. From Market Square Park, people walked to the Chase building Downtown and rallied there for a time. Below are people at the Chase Building. From the Chase building, people went to Houston City Hall. Below are folks in front of Houston City Hall. 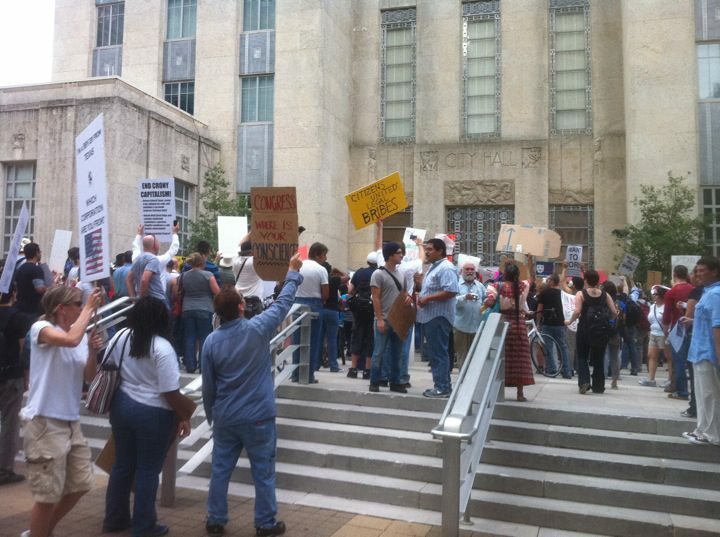 Here again are Occupy Houston backers at Houston City Hall. This fellow citizen you see below took the work of freedom and democracy into his own hands. This is the type of effort that reflects well on free citizens of any ideological leaning. 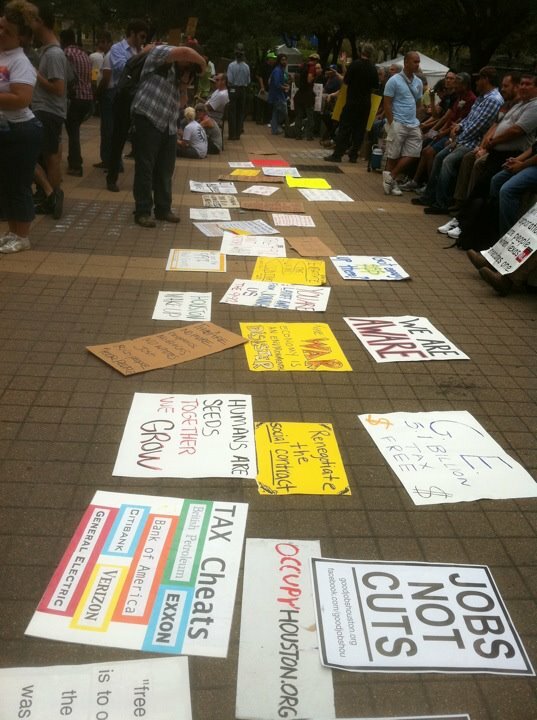 Below are some of the signs from Occupy Houston. 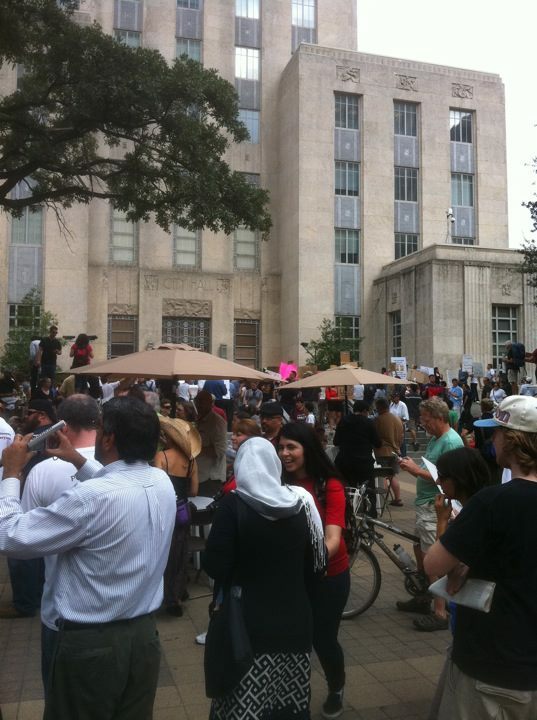 The plan is for Occupy Houston to camp out at Hermann Square in front of Houston City Hall. Over time I imagine there will be public speakers and other events at that location. What will constitute success for this effort? This is not clear as of yet. It does not yet have to be clear. The Occupy Wall Street effort and other such efforts across the nation, have helped put issues of corporate greed and the declining condition of the American worker back on the table. These are the issues we need to be discussing rather than more cuts and austerity. Here is the Occupy Wall Street web page. Here is the Occupy Houston web page. Occupy Houston is taking donations to keep the operation going for the long haul. 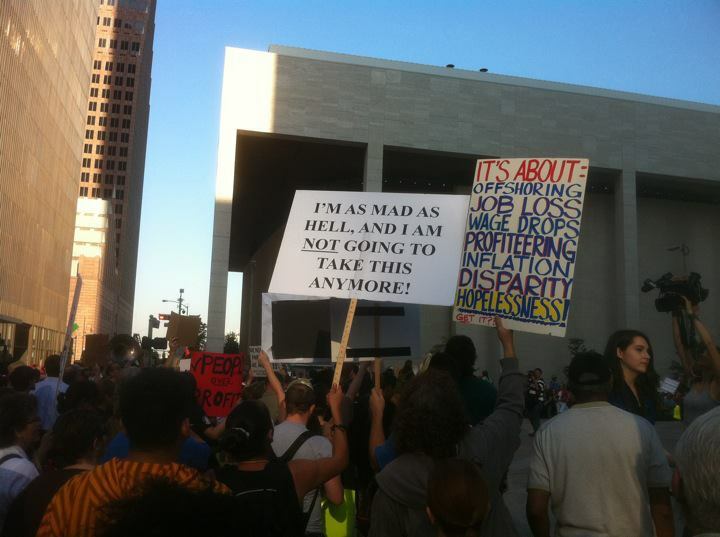 There are also Occupy Wall Street and Occupy Houston pages on Facebook. There are Occupy pages for many cities on Facebook. Take the time to look around the web for yourself to see where this cause is headed. It may flame out or it may last for a long time. President Obama commented today on the Occupy movement. Mother Jones magazine has a great interactive map of Occupy events across our great nation. 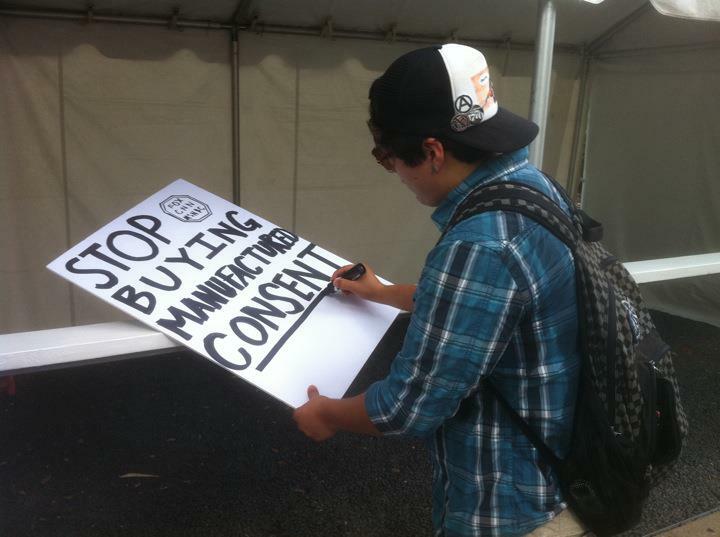 This link also includes a timeline of the Occupy protests. Mother Jones also has a great series of charts for you to see for yourself the wealth inequality in our nation. The issue is not resentment of the rich. The issue is the ability to get a good job in America. The overwhelming number of people in America just want to work and be able to earn a decent living. The crowd in Houston today was good-natured and hopeful. The police were helpful. More passing motorists honked in support than yelled out something nasty. If you are in the Houston area, go down to Hermann Square and see what is happening. 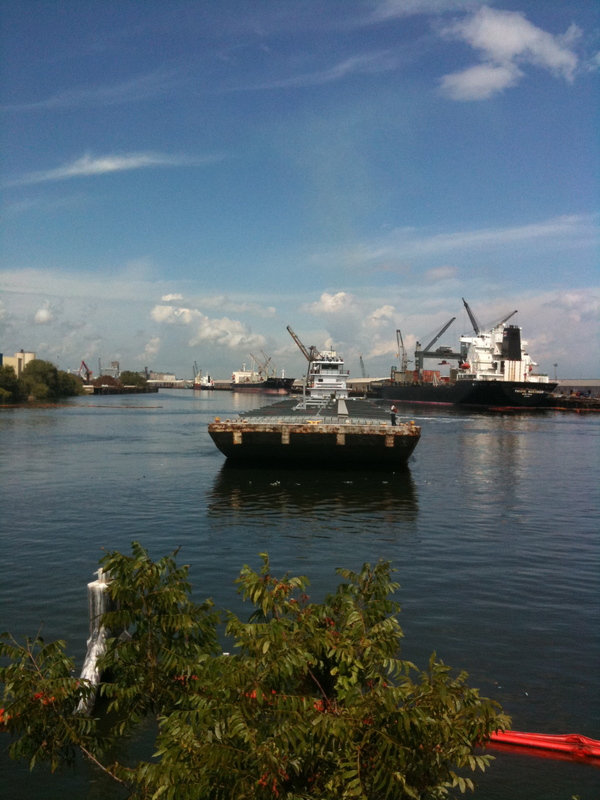 Follow Occupy Houston on the web and on Facebook. No matter where you are—You can learn about this movement on your own and determine what you think. My own view is that it is great to have a possible counterweight to the Tea Party, and it is great that everyday people are getting involved in the work of taking back our country from big money.